Who Carries With Them a 60 amp RV Adapter? There’s no way we can plug our trailer’s shore power cord into this thing. Eight years ago, on our first big full-timing adventure, we pulled to our assigned parking place. After leveling, unhitching, and getting out hoses and cords, we realized the site only provided electrical hookups for 50 amp plugs. Reconnect the truck and trailer, move to another site, try again. Another time or three we failed to check utilities (and the length of our cords and hoses to reach these) BEFORE we unhitched the truck and trailer. We had to hitch up the truck and trailer and move to a spot where we could enjoy the utility connections for which we paid and upon which we still thought ourselves dependent. But, back to the point . . . Yesterday we used our 12-3 20 amp-rated tool cord to connect the trailer to a regular 20 amp receptacle. Later, while walking the fairgrounds, we found a 50a – 60a adapter provided by the fairgrounds. This morning I plugged our 30 amp shore power cord into our 50 amp adapter into their 60 amp adapter into the NEMA 14-60 receptacle. It’s really simpler than it sounds. I mention this only because I think it so odd we’ve traveled extensively these past ten years and only just now encountered our first 60amp receptacle in a camping spot. 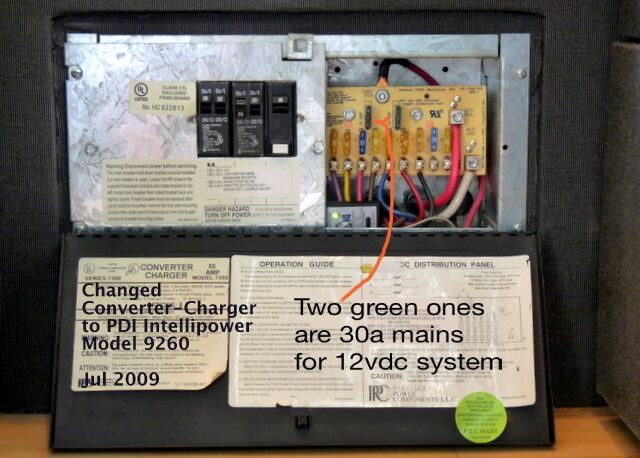 We bought a 30 to 50 amp adapter years ago and use it a few times a year. No, we aren’t going to buy a 50-60 adapter. Not yet, at least. Fortunately, at least for now, I can return to Woodland Ridge the same evening. We arrived Monday evening after an evening and morning of preparations for travel. From May through September we will be traveling a lot for The Airstream Club. Tomorrow we have a gaggle of errands. We’ll visit our storage unit to lighten the truck and RV. We’ll do annual renewal for truck and trailer registrations. Drop off a few clothing and goods donations, say hello and “Ow!” To our dental hygienist, and we’re back up on the mountain a few more days. The past few days have been idyllic. Quiet, gorgeous weather, and watching springtime arrive on our hill. We’d like to stay unti everything blooms, but duty calls. We enjoy and look forward to our Club activities. This Spring we’ll be in West Virginia, Ohio, and Pennsylvania. We’re planning a stop in NC and GA on our way to Farmington NM for the WBCCI IR. Then, zoom east-northeast to join up with the Viking Trail, one of WBCCIs most venerated caravans. This promises to be a lot of fun travel. Preparing is good too. Today Jim spent a few hours emptying and re-organizing the truck bed for our next season’s travels. Not sure our modest little 5X7 storage cubicle will hold all Jim plans to leave there, but we’ll try. Even full-timers tend to accumulate stuff. Sort of an insidious human condition, like storing a little body fat as winter approaches. We find ourselves sifting through our RV and truck a few times a year to identify things we really don’t want to haul. Today we went through our closets, totes, and the truck bed. Big change in the truck bed. This picture might not do it justice. The primary two effects are a reduction in the amount and weight of stuff in the bed, and a lowering of the height of goods in the truck bed.